In feature documentary Gazing the Sky Director Horacio Alcalá bares witness to the physical exploits of eight circus acrobats from across the globe as they twist, turn, fly and contort through space, risking injury in impressive displays of dedication to the pursuit of their performance dreams. DN talks to Alcalá about his seven year journey to document the extreme levels of dedication and focus which goes on behind the scenes of the stage’s limelight. How would you characterise the modern circus against the antiquated ideas of animals and clowns which still persist in the minds of most people? I would not compare it nor judge it. Contemporary circus is the evolution of the classic one, and we have to understand that circus is evolving within culture and mentality. Circus is moving along with our concepts of performing and entertaining which no longer includes the use of animals. On the other hand contemporary circus or modern circus is more expressive in the sense of characters. It is more theatre based and more committed perhaps to tell stories which replace the master and the beast performances of the past. At its heart the film is a series of eight extremely personal portraits. What was it about these particular performers that earned them their places in the film? Simple people doing extraordinary things is what they have in common, people like you and me but with the strong desire to fly and to see from above. Somehow what has happened in their lives is what has happened or is happening to me – I see myself reflected in their attitude and strength. The whole process, from the development of the idea to the day the film was wrapped in the postproduction lab took me 7 years. I spent 3 years traveling around the world looking for the stories and the characters, for me the 8 characters also reflect the different paths that circus can have. Grazing the Sky is a documentary which spanned the globe during its production. What was your approach to shooting in such a varied amount of locations and countries? Sometimes the crew was 17 people and sometimes it was only me and the producer. In Palestine it was difficult to bring a crew and we had to go to the the Jordan river illegally, it was a challenge but it was fun. All the locations came about depending on the idea of the artist, we were always looking for a contrast. Filming both in studios and outside demonstrates how wide the possibilities are for circus. You provide each performer with a space in which to demonstrate their art form, each with its own individual staging. What was the process for devising the best way to capture each performance? I worked individually with each artist, we developed the stories together and together we defined the way to portray their art. This was the most interesting part for me in the development of the project. The challenge was to portray circus as a tool that can be used anywhere, from a street in Torino to the desert in Palestine. Each story was conceived as a separate project, we treated each story as if it was a short film. This also carried through to the edit. Once we had the eight separate stories then it was just a matter of mixing. 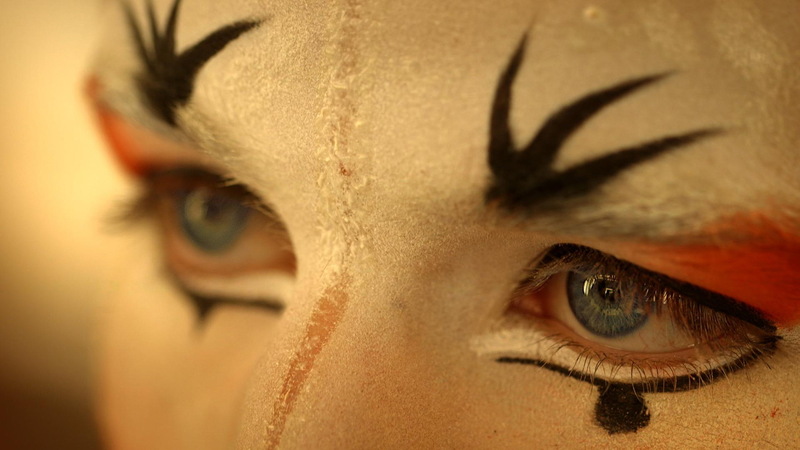 There is no overarching story binding them together, the only thing that they have in common is circus. The soundtrack provides a beautiful and essential accompaniment to the varied personal histories and performances. How were the various tracks selected? Most of the music was scored for the film, I was meeting musicians in Serbia and Bosnia, and also from México. I wanted to try various styles as exploration was an important part of the process for me. The musicians did not know which section of the film they were playing or performing for, it was like a blind process for them. You completed Grazing the Sky in 2013, but it’s only now making its way out into the world. Were there particular distribution challenges you encountered? The particular problems where that the circus documentary is not a common format and therefore distributors don’t know how to deal with this topic. Some distributors wanted famous characters but of course that was impossible. For some markets this film can be too artistic because it’s based on aesthetics. Most of all, both distributors and marketers still thinking that circus is about caravans and clowns, so it’s difficult for them to image that circus can be staged anywhere. We are currently working an a series titled Battle in Heaven which is 13 episodes, 3 artists per episode with the same format and style of Grazing the Sky. We are currently in the development and fund raising stage. I think circus still has a lot to give to cinema and TV. Grazing the Sky hits UK cinema screens this week.